In 1910 Collins Brothers started off as a local household goods moving firm. Today we operate a large fleet of vehicles which handle local household goods moving on a daily basis. 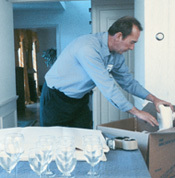 Every member of the Collins Brothers' team is thoroughly trained in all aspects of the local move. Our packers are armed with the most up-to-date packing materials available. Our drivers undergo hours of training on the loading and unloading of a household shipment. Our drivers undergo hours of training on the loading and unloading of a household shipment. A field supervisor monitors each move for quality and is available at all times to answer questions and foresee any problems which may arise. Our personnel are not only skilled packers, movers and drivers, but also gentlemen whom you will be happy to have in your home.